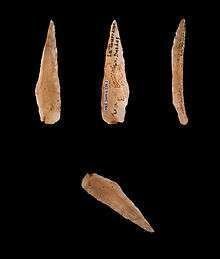 Azilian points, microliths from epipaleolithic northern Spain and southern France. In the language of Prehistorical Archaeology, the most extended trend is to use the term "Epipaleolithic" for the industrial complexes of the post-glacial hunter-gatherer groups. Inversely, those that are in transitional ways towards artificial production of food are inscribed in the "Mesolithic". Some authors reserve the term "Mesolithic" for the cultures of Europe, where the extinction of the Megafauna had a great impact on the Paleolithic populations at the end of the Ice Age, from about 8000 BCE until the advent of the Neolithic (Sauveterrian, Tardenoisian, Maglemosian, etc.). Epipalaeolithic hunter-gatherers, generally nomadic, made relatively advanced tools from small flint or obsidian blades, known as microliths. that were hafted in wooden implements. These were most likely the main food sources throughout the Pre-Pottery Neolithic A (PPNA) period. Of these animals, it is likely that only the equids were migrational. ↑ Byrnes, Andie. "Epipalaeolithic." Epipalaeolithic. N.p., 2005. Web. Dec. 2014. This article is issued from Wikipedia - version of the 8/16/2016. The text is available under the Creative Commons Attribution/Share Alike but additional terms may apply for the media files.